To create a new manual journal, go to “Accounting”, “Journal” in the main left menu. This opens the list journals page. On the top right of the page click on “Create manual journal”. Now you can enter the details of your manual journal. 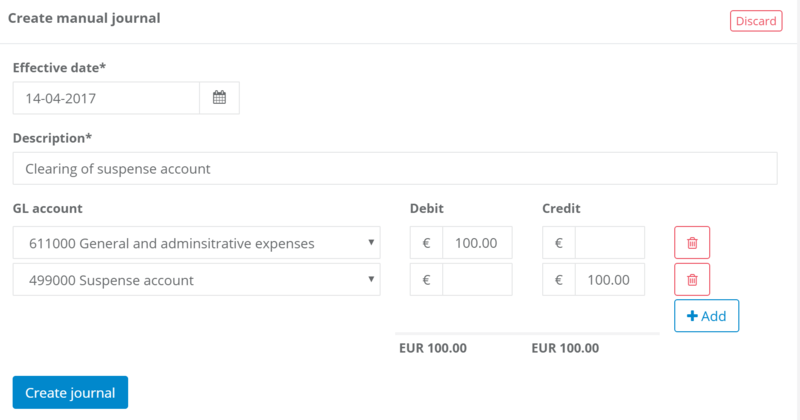 Set the accounting date of the journal, enter a description and add the line items. Each journal entry needs to have at least two journal entry lines. Each journal line has either a debit or a credit entry. The total of all debit entries needs to match the total of all credit entries. Certain general ledger accounts are protected from being used in manual journals. These are the accounts receivable account, accounts payable account and all financial (bank) accounts. Posting to the accounts receivable and accounts payable account can only be done by creating an invoice or purchase. It is not possible to post manual corrections to those accounts. To create journal entries that include a financial account use the create transaction, or reconciliation functionality of the financial accounts module.